First, let me say congratulations to the winners of my giveaway! Check below for the winners - there was one person I was unable to contact through email. Their email bounced back, so if that was you - let me know! So, here is a bit of information for you, but I am also looking for any tips/tricks/thoughts you might have that I can incorporate into my presentation. To put it simply, Socrative is sort of like using a clicker. Socrative is an app that allows you to ask your students questions and get immediate feedback from them. For example, you can ask a true/false or multiple choice question. Students get out their device that can connect to the internet and answer. You have immediate feedback on whether they understand a certain idea or can answer a certain question. Students don't have to create an account or remember a password. You can ask a question on the spur of the moment. You don't have to create something in advance if you don't want to. Students can use any device that can connect to the internet. A part of Socrative that I haven't explored too much is the ability to give a quiz. I see that you can do it, but I'm not so sure that I will use that capability…I can't see how you could keep students from doing someone else's quiz. I am interested in any feedback you might have! 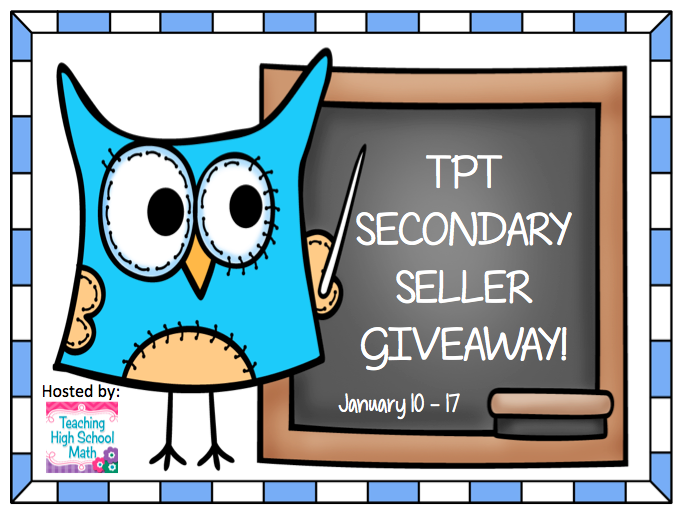 Huge Celebration and Teachers Pay Teachers Secondary Giveaway! It was a little over a year ago that I found Teachers Pay Teachers. It has been a terrific year for me - I have met people I never would have met otherwise and because of them I have been re-inspired in my own classroom. 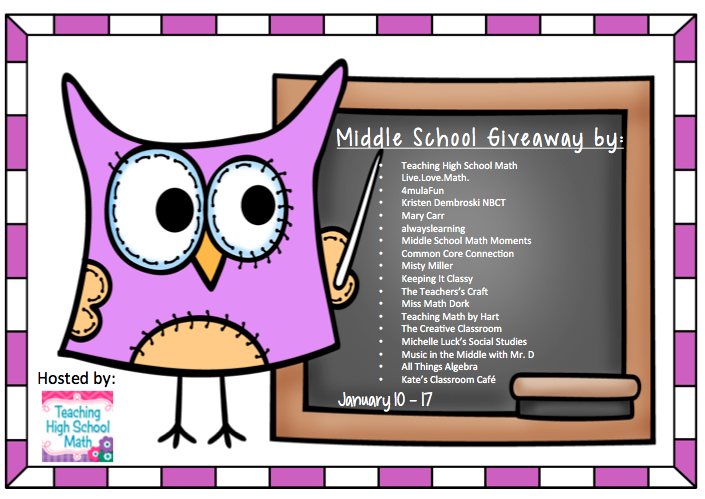 A Great Collection of Middle School Resources! 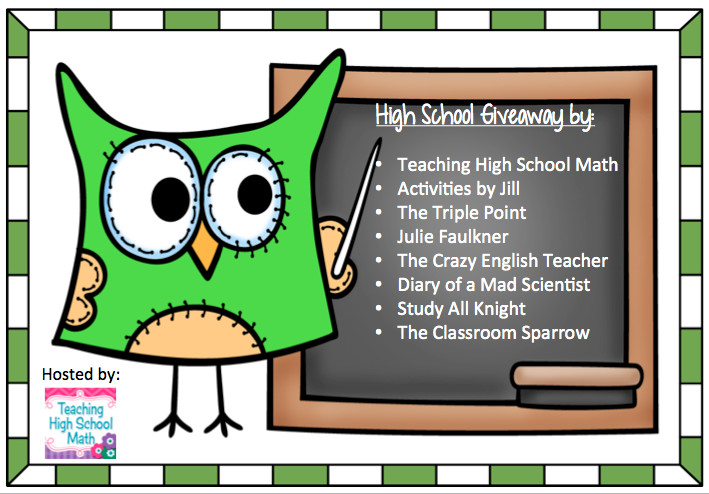 A Fabulous Package of High School Resources! Thanks so much for entering and good luck with your second semester! I got it for Christmas and it is terrific! 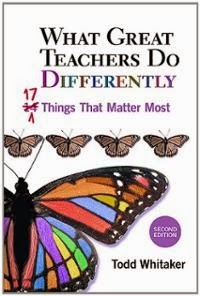 If you are so inclined, here is a link to look at this book on amazon...What Great Teachers Do Differently. If I could humbly add one more thing that Great Teachers Do Differently, especially in high school, would be great teachers have to be completely in command of their subject area. Kids can quickly see through you…maybe this is especially true in math class. You have to be able to solve the problems assigned and make connections to other problems and topics. You have to be able to answer the question what if…and why? One of my biggest pieces advice to new math teachers is that you MUST do the homework you assign. Problems that you think were about to go one way can quickly go another and as a new teacher you need to see that before anyone else! So it's snowy and cold here in the Midwest - I am predicting no school tomorrow - how about you? Even though we still have a couple more days of Christmas Vacation, it's time to start thinking about lesson planning for the new semester.